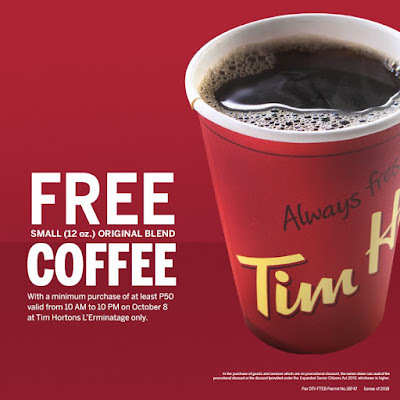 Tim Hortons is celebrating the opening of its newest branch at L'Ermitage Salcedo Village in Makati with a FREE Coffee! Enjoy a FREE small (12 oz) Original Blend Coffee with a minimum purchase of P50! Valid from 10am to 10pm on October 8, 2018 only at Tim Hortons L'Ermitage Bldg., Salcedo Village, Makati City.